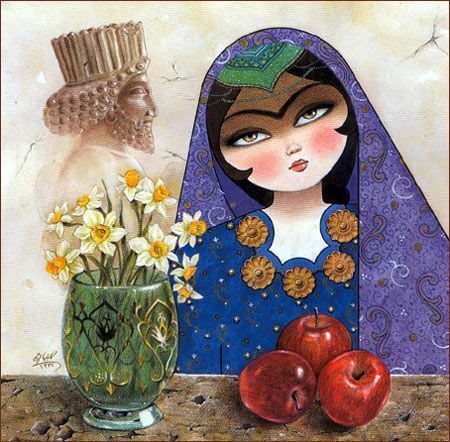 Nowruz - Happy Persian New Year! 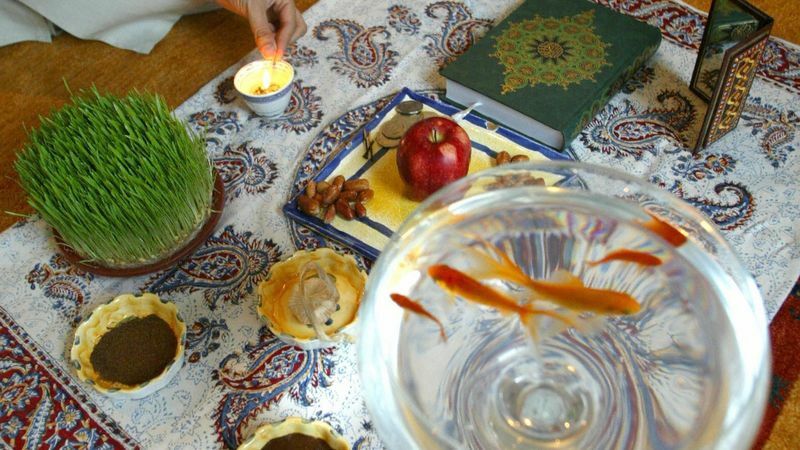 Let's first start with why the *Persian New Year is called *Nowruz! Nowruz literally means 'New Day' and starts on the first day of spring, on the spring equinox, and is celebrated at the exact moment that the earth's axis hits the turning point in it's orbit where neither the north or south poles are tilted towards the sun, and when night and day are almost the same length. Meteorologists officially mark this turning point as going into the new season and for Iranians, the start of our new year. This year the spring equinox takes place on Tuesday March the 20th and in Iran the time will be 19.45. Iranians all over the world will celebrate either at the exact time it happens in Iran or when the orbit actually happens in their own country, even if it happens to be at 3.15 am!! Obviously the exact time of the new year will change every year and in Iran, even if the new year falls at some awkward hour, people will still go and visit their close relatives right after the new year enters. People will also phone each other and wish each other a happy new year. Both when visiting or phoning, tradition means that the younger generations have to visit/call the elders first. So, even if you desperately want to call or visit someone to wish them a happy new year, if they are younger than you, you need to wait for them to visit/ phone you first. It's basically a gesture of respect for our elders. This link is really useful for anyone wanting to know the exact time of the new year in their country. 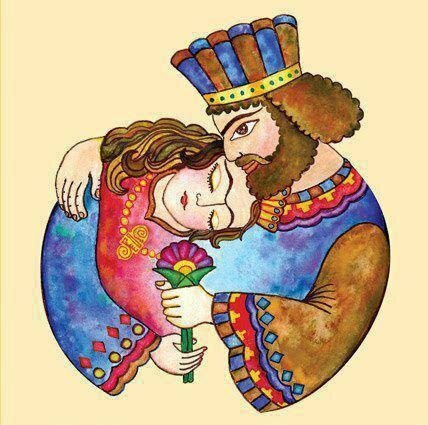 Nowruz has been celebrated for over 3,000 years and mainly stems from times of Zoroaster, when Persia's religion was Zoroastrianism, before the Arabs invaded Persia and brought Islam to them. 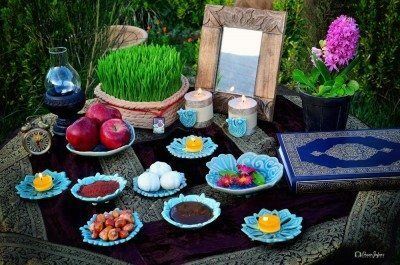 Many of Iranian traditions are rooted from Zoroaster and we have Zoroastrian Iranians, who will probably know even more about the Persian New Year traditions than I. Although rooted from Zoroaster, all Iranians of all religions (As well as Zoroastrian and Moslem, we have Jewish, Catholic, Christian and Bahi Iranians too) celebrate. Also, research shows that Nowrouz was celebrated by people and royalty during the Achaemenid times (555-330 BC). People also say that at the Persopolis, the palaces of Apadana and the Hundred Columns were built specifically for the purpose of celebrating Nowruz. 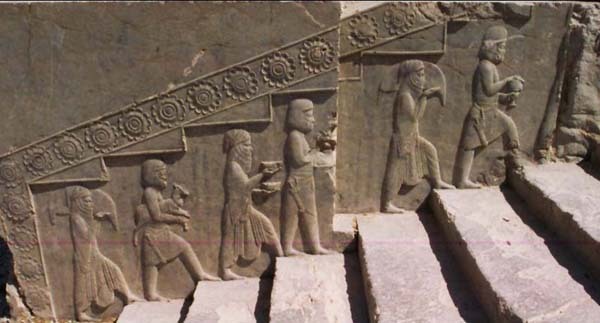 In the picture below you will see people bringing gifts from all over Persia for the King. Zoroastrians also call Nowruz, Jamshedi Nowrouz, named after the legendary Pishdadian King Jamshid who is described in the poet, Ferdowsi's, epic poem, Shahnameh (Book of Kings). Afghanistan, Albania, Azerbaijan, China (by the Tajiks & Turkic peoples, Georgia, India (by the Parsis) Iraq (by the Kurds & Turkmens), Kazakhstan, Kyrgyzstan, Pakistan (by the Pashtuns & Balochs), Russia (by the Tabasarans & the Crimean Tatars and so on), Syria (by the Kurds) and Tajikistan. 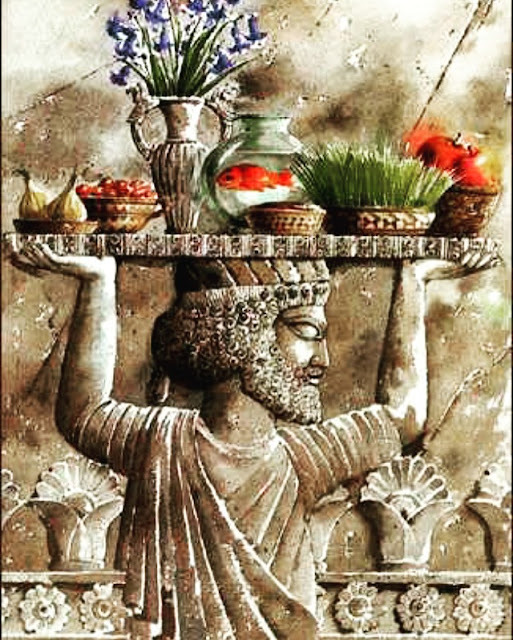 I am very curious to know how similar the above countries celebrate Nowruz to us Iranians, So, if you are from any of the above countries, please do leave me a comment to let me know how you celebrate! The *Persians have soooooooooooo many traditions for soooooooooo many different events and maybe I am being biast, but I find them all so fascinating, interesting and mostly fun! However, the two most fun for me are the traditions of Iranian weddings and The Persian New Year and all that it involves. From at least a few weeks before, people start their 'Khaneh Takooni' which literally means 'shaking the house' and is basically a major spring clean.This will include fixing anything broken, painting walls, washing curtains, windows, tiles, floors, rugs and carpets and basically cleaning every single corner of our homes. *The above picture is taken from the really cool Les Persiennes which I've just discovered! 'Chaharshanmbe' means Wednesday and 'Souri' means red - and this tradition is done on the eve of the last Wednesday before the New Year. 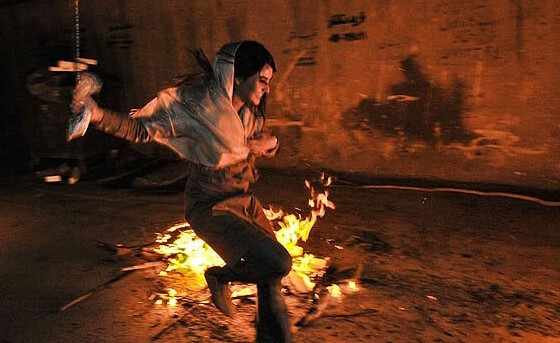 People gather around at sunset and beyond to jump over fire and eat a favorite Persian broth called Aash Reshteh (my favorite thing ever, especially because of the 'kashk' which is made of fermented yogurt - it is soooooo delicious!) 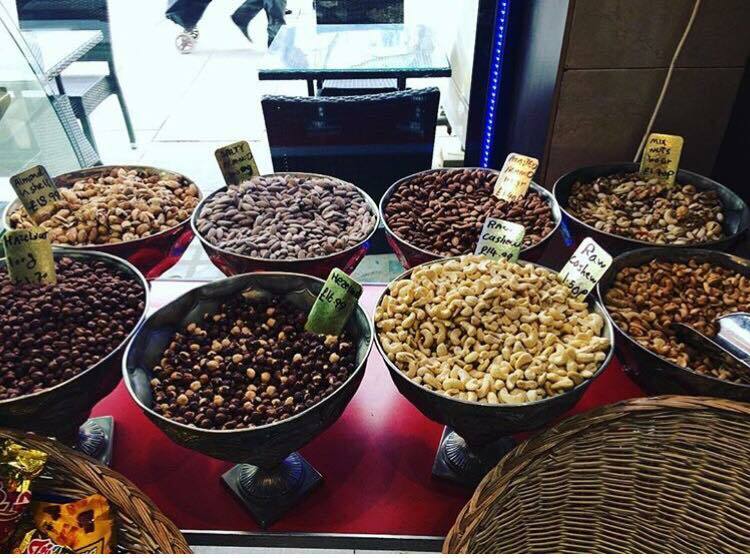 and people also eat a nuts, dried fruit and seeds mix called Ajeel. We have two mixes of Ajeel, depending on the seasons, but for this occasion and the new year we eat the sweet kind which is soo yummy! If you have any Iranian supermarkets near you, I urge you to go in and ask for this mix- they will probably have them set fresh in baskets for you to pick and mix yourself (while you're at it, ask for some Persian pastries too!). 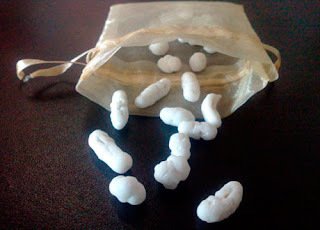 For me no 'Ajeel' is complete without 'Noghl' which is a sugar coated almond Iranian sweet. I love them! They are always used for celebrations such as Nowruz and weddings. This ritual is basically a purification rite, getting you ready for a positive and healthy year ahead! Nearing the New Year, for a few days before, you will see men dressed as Haji Firouz who is dressed all in red and plays the tambourine, singing a specific song, letting people know that the New Year is on it's way. Is quite similar in looks to Santa Claus with his white beard and gives presents and wishes luck to people. This very cute video/cartoon captures people getting ready for the New Year, doing their khaneh takooni and preparing the haft-seen. and Haji Firouz and Amoo Nowrouz also make an appearance! Unfortunately their subtitles come in late and miss a lot of the translation, but still you can see what's going on visually. It's very sweet. Once the ''Khaneh Takooni' is done, people will start making the samanu (wheat germ) and baking pastries and generally decorating and preparing food for Nowrouz. A couple of days before Nowrouz, we set up our 'Haft-Seen', which literally means '7 'S's'. Each one of these items, as you may have guessed it, starts with the letter 'S'. A long time ago, it actually used to be Haft-Sheen' for things starting with 'Sh', like 'Sheereeny, which means sweets and 'Sharab' which means wine! One of the most important things for the Haft-Seen is the 'sabze' which can be either a wheat or lentil or mung beans sprout. Traditionally you are supposed to sew and grow it yourself - but for some growing seeds can be unlucky and they find this out through generations and if this is the case, they will buy them already sown or others will give it to them as presents. 5. Senjed (silver berry from the lotus tree) - is a symbol of love - they even say if you lie under the tree when it is in full bloom it's scent and fruit will make people fall in love and forget about anything else and some say, love will find you soon. 1. Usually a holy book (depending on your religion) and also Persian poetry books of either 'Ferdowsi, Hafez, Saadi, or Molona (Rumi) as poetry is a big part of Iranian culture. Almost everyone will quote some form of poetry even in casual conversation as a saying or reminder or just for the joy of reciting. It really is part of our every day language. 2. Goldfish- represents life, fertility, good omens, good luck and abundance. It's always great news if the fish have babies and if a fish dies, you see it as some really bad luck escaping you and striking the fish instead. 7. Noghl, Sohan and other Persian sweets - for a sweet, lovely year! 12. Narenj (Seville Orange) placed in a bowl of water - Represents the earth floating in space! 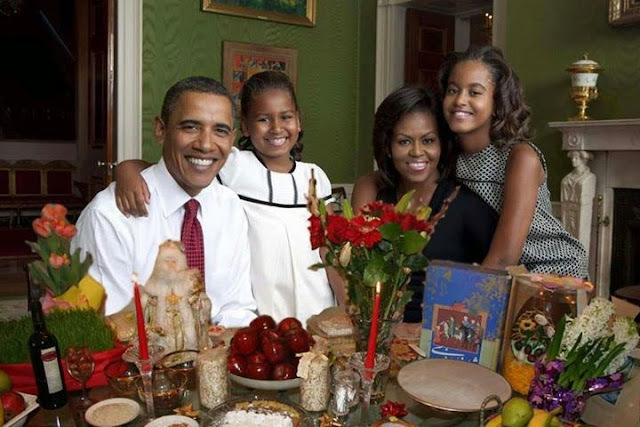 Even the Obamas set a 'Haft Seen' and Nowrouz events at The White House and the Canadian parliament marked it as an official holiday since 2009. People make sure they look their best, they would have had their hair done, dress in the nicest outfits and just make sure they are clean and bathed and looking their best. Everyone has to wear at least one new item of clothing, even if it's your underwear, but preferably a new outfit would be expected. People then sit around the Haft-Seen and recite poetry, eat yummy sweets and listen to wonderful Persian music. It is said that whatever you are doing at the precise moment of the new year and the arrival of spring, is what you will be doing for the rest of the year! So usually people make sure they are with their loved ones, happy, on their best behavior, laughing, joking, dancing and some will also hold some 'sekeh' (gold coins) in their hands to welcome prosperity for the coming year. This is the time to eat Sabzi Polo Mahee (green herb rice with both smoked and freshly fried fish) and kooko sabzi which is a herb and egg omlette dish that is just DELICIOUS! People also start visiting each other's homes and carry on doing this for the entire Nowruz period, which is for the next 12 days. 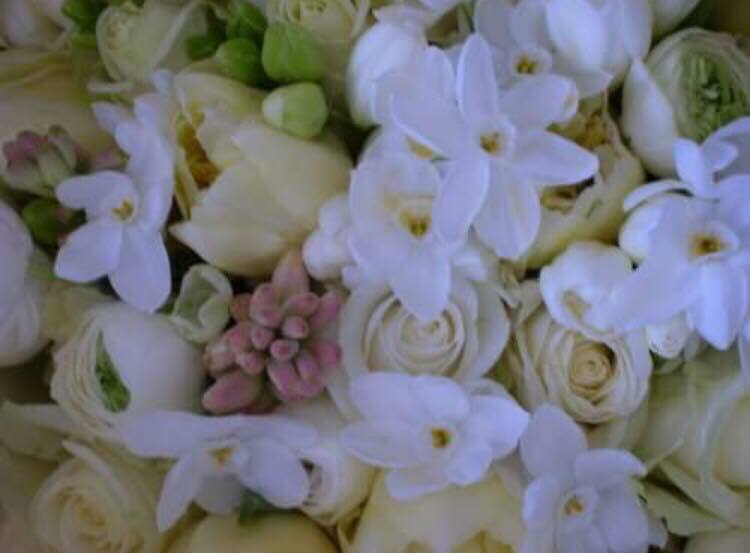 People also send each other beautiful floral arrangements. 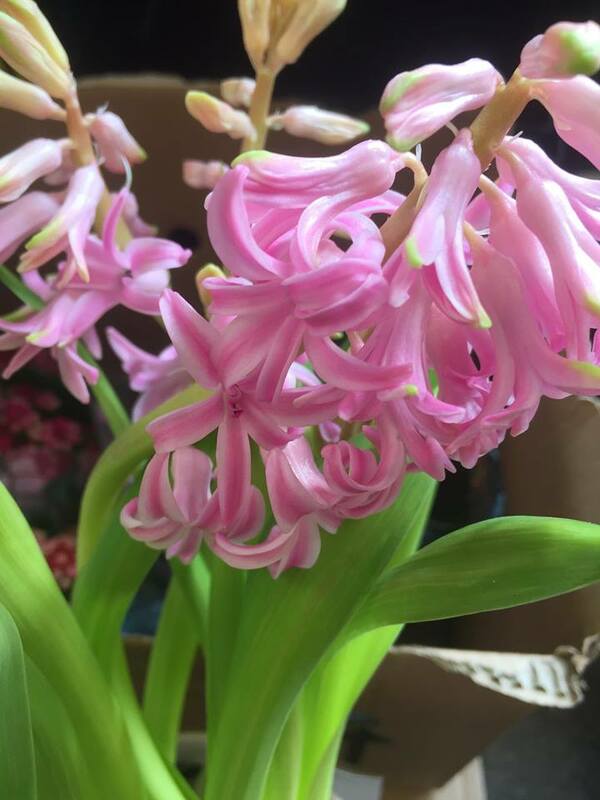 This a gorgeous one my mom received. As previously mentioned, people start visiting their elders. A nice bonus is that elders always give 'new' money to the younger ones. People will go to the bank and ask for new money rather than one that has been going from hand to hand and have them ready for any visitors that may come by! 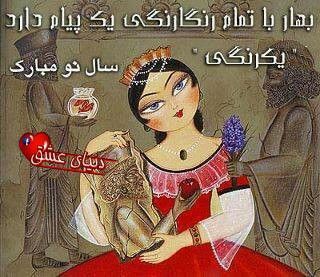 Nowruz Pirooz! Wishing you a victorious and prosperous New Year! Sad Sall bé in Sallha! Wishing you 100 more happy years! Eid-eh shoma mobarak Happy New Year to you! (this is not to be mistaken with the Moslem 'Eid'). Nowruz Mobarak Happy New Year! Nowruz Baad - Nowruz welcome! Sale No Mobarak - Happy New Year! 3. Don't be sad or moody or cry or pick a fight! The next day rice and noodles (Reshteh Polo) are served.The rice and noodles represent longevity, prosperity and a good harvest ahead. Sizda is the number 13 and bedar means 'out the door'. Iranians believe 13 days after the new year is an unlucky day therefore they have to leave their house to take the bad luck with them. Traditionally people pick up their sabze from the haft seen and head of for a picnic. They feel that the sabze would have absorbed all the negativity. It's always such a fun and wonderful day, full of delicious Iranian food and laughter! On their way to the picnic, people throw their sabze in any running stream that they see, so as to let the bad luck go away - they also sometimes tie a knot in it and make a wish before they let it go. Some unmarried girls who wish to get married, first tie a knot through a couple of the leaves and make a wish that they are wed by the following year and then throw the sabze in the stream. The traditional food to eat on this picnic is Aash, sweet ajeel, baghalee polo and lamb shanks. And yes, they cook and prepare these at home and take their big pots to the picnic. Some people will even make kebab barbecues. My mouth is watering already! and has a completely different alphabet to the west, when one comes to put the word into English, inevitably one comes out with different spellings. Some people spell Nowruz, Norouz amonst many other variations. I actually prefer to spell it 'Norouz' but have spelt it the way I see most commonly spelt. , Also we do say 'Eid Mobarak' as well as 'Nowruz Mobarak' but for non Iranians the word Eid' can get mixed up with the Islamic celebration, which this is not, so therefore to not confuse non Iranians any further, I have stuck with the word Nowruz throughout this blog post. Also, you would notice that I go back and forth between the Iran and Iranians and Persia and Persians. This would need another blog post on it's own and different stages of history. But just to say that even in the time of the Persian Empire, the Persians themselves would refer to each other as Iranians! I do understand why some Iranians and also foreigners prefer to use the words Persia and Persian, because this expresses more of what Iran used to be before the Islamic revolution in 1979. Also, Iran has such a deep culture and history that obviously stems from the Persian Empire and is really inbuilt in us Iranians. Us Iranians have a lot of tradition in our blood , at least I speak for myself anyway when I say this. I moved to London when I was 6 years old and yet I always feel Iranian and I always respect the traditions. This to me, comes from our long history that stems from Persia. I, like many, have read a few books on Persia, the Persian Empire, The silk road, Iran and more but one book that really stuck in my head and was so informative was Michael Axworthy's, 'Iran: Empire of the Mind: A History from Zoroaster to the Present Day. I recommend this to both non-Iranians and Iranians alike. Wishing every one a wonderful and very Happy Nowruz!